EU policies promoting markets and competition were institutionally imposed on Greece by the EC in the 1980s and 1990s. The sovereign debt crisis which first emerged in 2010 has changed the rules of the game. External players, that is, the European Commission (EC), the European Central Bank (ECB), the International Monetary Fund (IMF) and the European Stability Mechanism (ESM) have now a clearer plan that goes beyond the general promotion of competitive rules and modernization of central and local administrations. 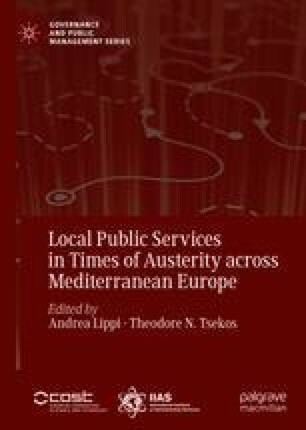 Under the specific conditions of the sovereign debt crisis, the transfer of austerity policies and the reforms that complement them, takes place within a specific context, insofar as national and local resistance is weakened by the country’s dependence on foreign funding. What ultimately result are reform policies of varying shapes and sizes, which are thus of restricted consistency and, consequently, of limited effectiveness. European Commission, Directorate-General for Economic and Financial Affairs. (2010). The Economic Adjustment Programme for Greece, European Economy Occasional Papers, No. 61. http://ec.europa.eu/economy_finance/publications/occasional_paper/2010/op61_en.htm. Accessed 4 June 2017. European Commission, Directorate-General for Economic and Financial Affairs. (2012). The Second Economic Adjustment Programme for Greece, Occasional Papers, No. 94. http://ec.europa.eu/economy_finance/publications/occasional_paper/2012/op94_en.htm. Accessed 4 June 2017.